All of the models I use for the infantry in my AK47 Republic forces come Peter Pig’s Range 17 AK47. 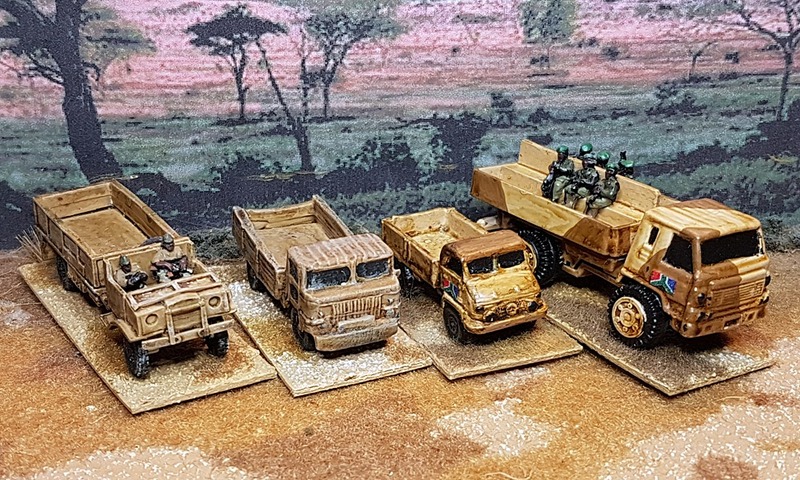 Tanks and vehicles come from a wider variety of manufacturers, Peter Pig, Skytrex and QRF provide most of my vehicles, though I have a lot of toy trucks that are used as transports or as the base for technicals. I put together most of my collection in the early 2000s, before the arrival of recent plastic sets from the Plastic Soldier Company and Battlefront/Flames of War, which provide some good, cheap, options for people wanting to build big forces. Though I have taken advantage of PSCs boxed sets for T55s and T34s. Having rediscovered the game in 2017 I’ve set out to expand my collection so that I can put together any two of the forces allowed along with all their possible reinforcements from the political flow-charts. I’m almost there, though I do have to buy some towed guns and some force combinations could leave me short of some troops types . One problem is militia, the People’s Popular Front can get 100 points of militia infantry armed with small arms (14 stands) and I’ve not got enough to do that if their opposing force is also heavy on militia. 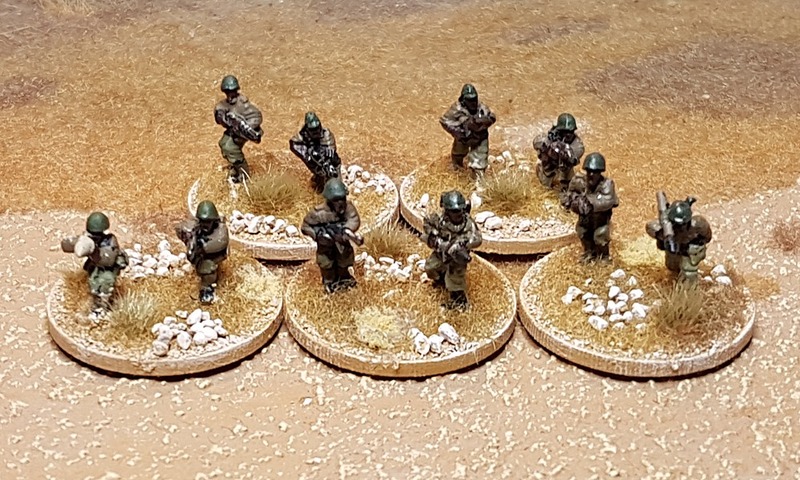 I’ve re-based all my infantry, two to a base on 30mm circles. I think it looks better than the squares in the rules as written and it gave me 50% more troops once it was done. 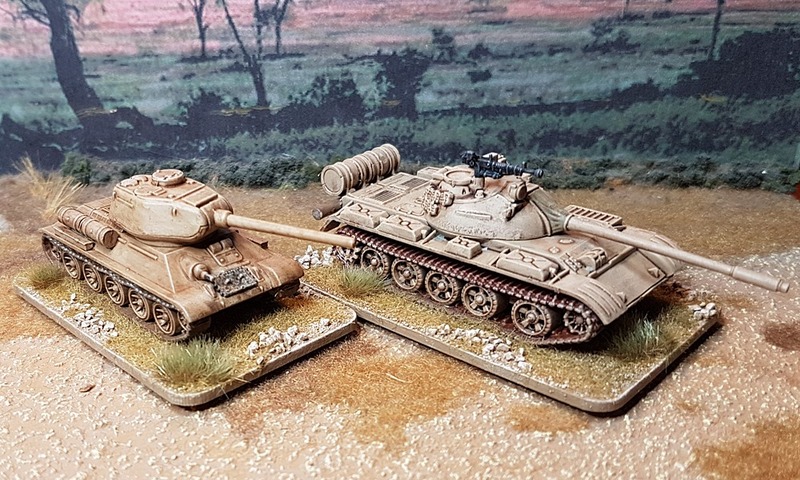 The approach I’ve used for army building is to get together a fairly large number of generic models that I can use to build any of the forces in the game, whilst also painting up distinctive units that only feature in specific forces. That means I can build any force I want, but that the forces I normally play in the game, a Dictatorship, a Religious Movement and a Colonial Power, each have their own distinctive style. In this blog post I’ll discuss the generic forces and later I’ll write another one about how I give my own favored forces their distinct identity. 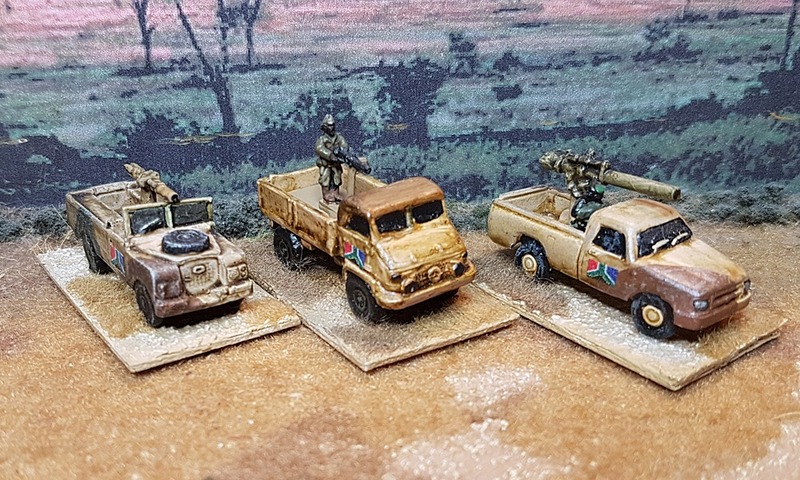 The major supplier of arms to African nations in the 1970s and 1980s was the USSR, so my generic forces for fictitious Africa around the same time period mostly get their kit from there. Alternative suppliers are the French, there are a few of their Panhard Armoured Cars around, and Toyota pick-up trucks from Japan are extremely common. Note that I play with the “classic” AK47 Republic rules, published in 2006, rather than the more recent version. You can still buy these rules, but only as a pdf, from Peter Pig. Militia make up the bulk of the forces of several of the armies in AK47, they are rather unreliable and can flee from the table very easily. You usually want to try and get them upgraded during the political phase of the game if at all possible. All my generic militia are old style models from the early 2000s and some of them are no longer available. 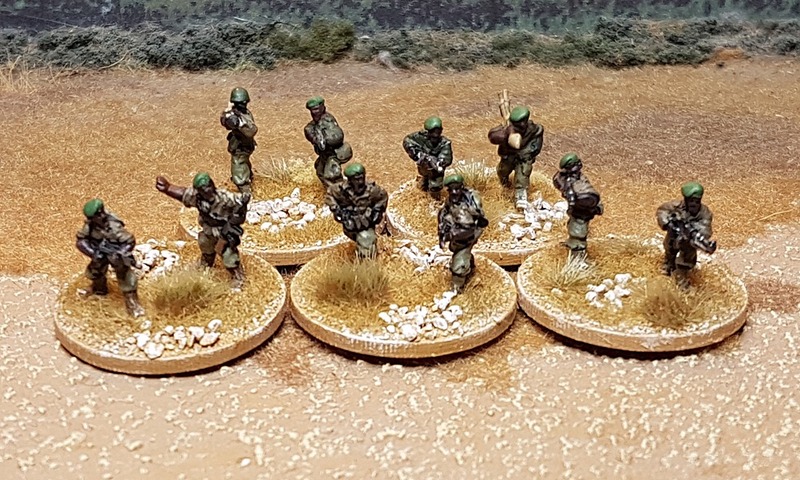 Peter Pig now have updated militia models in their range including figures with AK47s, bolt action rifles, LMGs and RPGs. They also do crew figures for heavy weapons and a Militia Command pack. They also do a range of what they term “hardened militia” though to my eyes their uniforms and weaponry make them more suitable for use as regulars. 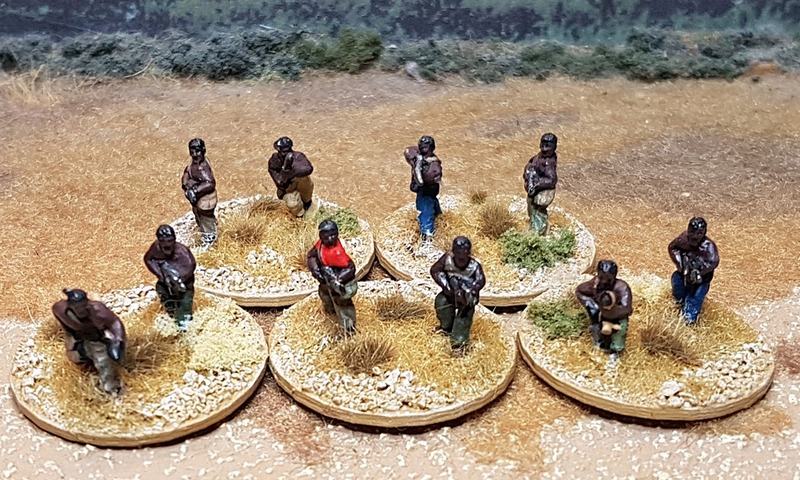 I painted some of my militia as wearing T-shirts, but most go bare chested. Peter Pig do two main types of model that I use for my generic Regular Infantry, some in caps and some in helmets. Both types come as full ranges with, with small arms, RPGs, as command packs and as heavy weapons crews. I have lots of troops on stands of just one type and some mixed together. This allows me to have two sides where the regular infantry all look different to their opposition. Looking at pictures of African conflict it looks like just about any troops that are considered even slightly elite have their own special coloured beret. Never one to miss the chance to use cliches my generic Elite troops all wear berets. I have two groups of them one with red berets and one with green. Both groups have enough models to give me two units. Again I can have two sides which look different to each other. 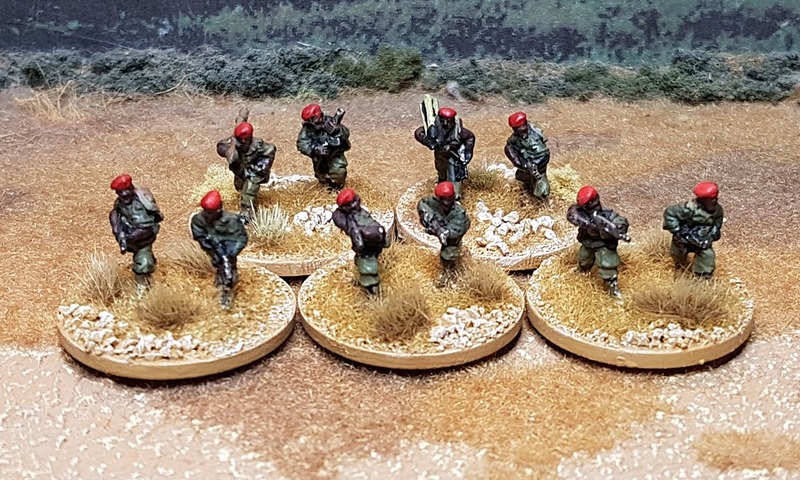 You can get models with RPGs and crews for HMGs, mortars, AA guns and RCLs for all the ranges I use as base troop types, they come in berets, in hats, in helmets and as militia. All the different heavy weapons have their advantages and, usually, disadvantages. RPGs can move and fire, but none of the others can, which is a bit of a pain, but they’re effective when they do fire. RPGs: Complete no brainers, get two of these (the maximum allowed) for every infantry unit. they cost the same as infantry with small arms and hit harder (if you make the die roll). HMGs: More useful in defence than attack, but a good support option and I usually have at least one with all my infantry units. Mortars: Expensive points wise, but they have a very useful range of 30”. Professional mortars have the added advantage that they don’t have to have line of sight to their target, just as long as it is in the line of sight of any professional quality group in their force. RCLs: I don’t usually use these unless they’re mounted on vehicles (see below). Having to roll that 3+ to get them moving has slowed me down too many times. I would never take them with militia who have a very small command distance. Towed AA Guns & Towed Guns: I hardly ever use these, though they can be useful if you’re on the defence and you get them on the table at the start of the game. I prefer to mount AA guns on trucks to give them some mobility while tanks and armoured cars provide mobile guns. My generic forces usually get T55s (I have nine of the things) though T34s are available as well. 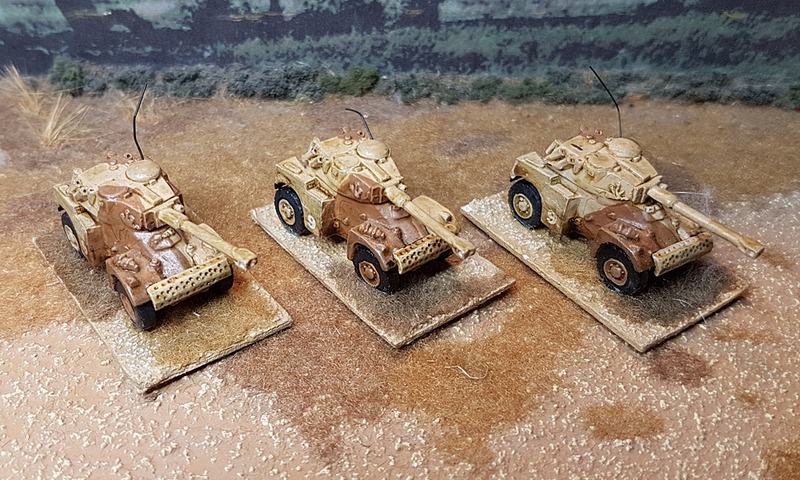 I prefer to stick with Russian kit so don’t usually use armoured cars, but these Panhards are available for my opponents. 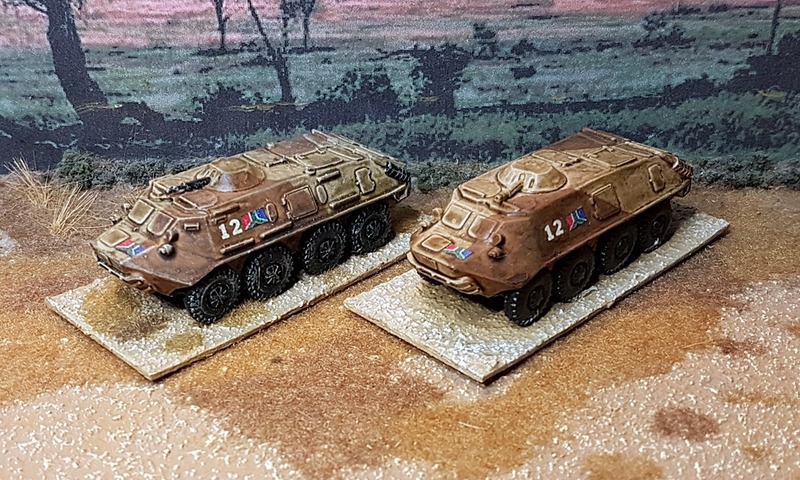 Russian again, I use these BTR60s. Most forces will usually only have a single infantry unit in APCs, they’re expensive things point wise. Whatever I can get from wherever I can get it. Toys and models from all over the place, cold war era or WWII, it doesn’t really matter. Most of my trucks have pieces that drop in the back to make them multi use. 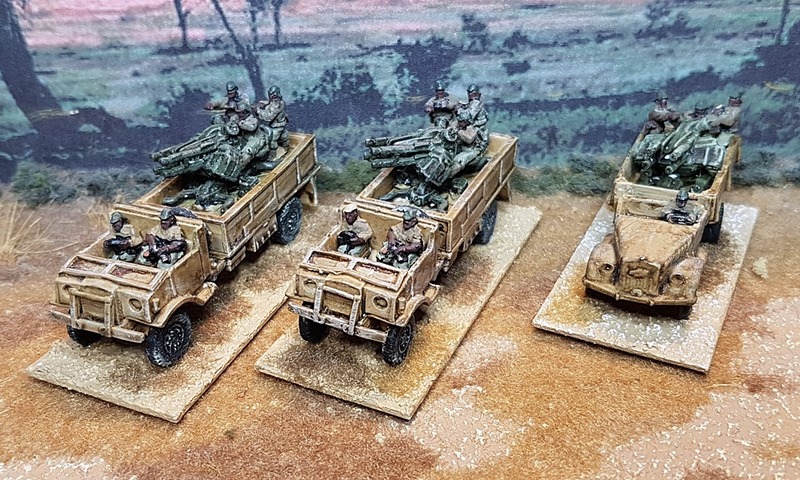 Trucks or jeeps mounting heavy weapons. These give you a fantastic chance to go to town with your modelling. I find trucks with AA guns really useful, they can stand off from infantry and give them a hard time and can sometimes deal with tanks, their long range helps them to stay out of trouble. Those AA guns are all drop in and the trucks can be used for other purposes. Recoilless rifles or HMGs on technicals are glass cannons, they hit hard but have to get in close to do so and tend to get destroyed quickly. If you’re lucky they sell themselves hard. Again I often use drop in pieces for these models. I’m not a particular fan and don’t use them very often. 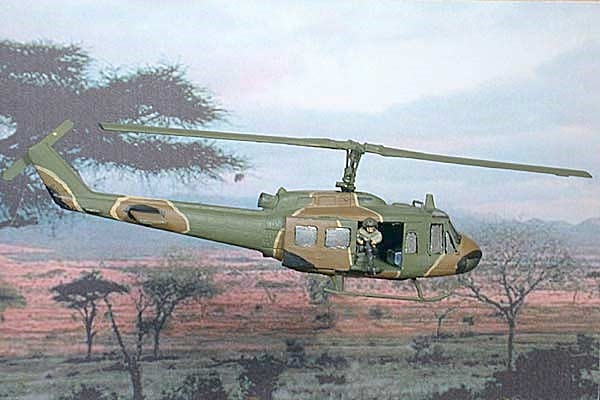 But I do have a couple of Hueys. As I said at the start of this article I can use these generic troops to build any of the forces used in AK47 Republic, but I do feel that a force built this way lacks character. I add that to my favourites using signature units that I’ll discuss in another blog post. Great paint jobs and well done bases!